Precision Steel Slitting – Rebel Steel Inc. When you need QUALITY precision slitting with true JUST-IN-TIME DELIVERY, turn to Rebel Steel. We have over 30 years experience in buying, selling, and processing quality steel coils. We also toll process customer-owned material. True flexibility — We deliver what you need, when you need it. 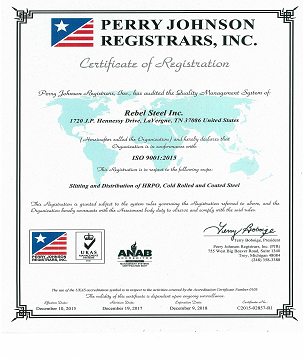 True quality — Our excellent reputation for delivering quality steel means you receive a product you will use and trust. We are locally owned and operated, and we are ISO 9001:2015 certified. Rebel Steel is located adjacent to Nashville, Tennessee, near the intersections of Interstate Highways 24/40/65. We are accessible by rail via CSX. 1720 JP Hennessy Drive, La Vergne, TN 37086 © Copyright 2007. All rights reserved. Site by Talstone Group.